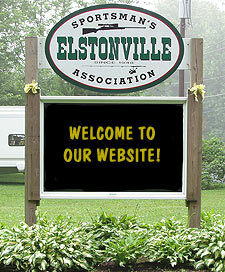 Elstonville Sportsmen's Association is located a few minutes from the Lebanon/Lancaster Exit 20 of the Pennsylvania Turnpike on Pinch Road. From Lebanon: Take Route 72 South, after passing the Turnpike entrance continue approximately one-half mile, turn right onto Cider Press Road. At the Stop Sign turn right onto Pinch Road. Go approximately one mile, Elstonville Sportsmen's Association is on the right. From Lancaster: Take Route 72 North, continue through Manheim. Go approximately five miles after Manheim. Turn left onto Pinch Road. Go approximately one and one-half miles, Elstonville Sportsmen's Association will be on the right. and leave your contact information with a bartender.